Goodbye girls in white dresses with blue satin sashes! So long embroidered smocks and crinoline frocks! It seems the ‘adultification’ of little girls’ clothes is all sewn up. How often have you seen a tiny toddler strutting down the street in tight jeans and a leather jacket? Pierced ears a’ twinkling and teensy tote a’ swinging? It seems in some cases, the younger they get, the older they look. Nowhere is this troubling trend more apparent than on celebrity offspring. Stylist to the stars Joey Tierney confirms that it’s not enough for a child to be cute in Hollywood: “he or she needs to live up to a stylish standard that exists in the industry.” Wow! Talk about pre-school pressure! At just three, Suri (daughter of Tom Cruise and Katie Holmes) has hundreds of websites dedicated to following here every fashion move. She’s got a wardrobe worth millions, cluttered with the kind of fashion clobber most would struggle to amass in ten lifetimes. This all begs the question: what happens when girls are keyed into their appearance at such a young age? Suri’s already been seen stepping out in heels: some might say that’s harmless fun, but I’ve always thought heels are associated with sexualization, at least in part. Though I know we’re talking about different times and traditions, I was reminded of the precociously-dressed pre-kindergarten crowd when I came across this portrait of Maddalena Cattaneo (1623) in the NGA. 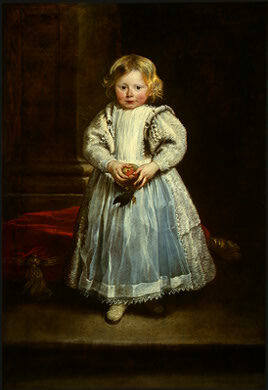 It’s by Anthony van Dyck (1599 – 1641), one of the greatest Flemish painters of the 17th century. Influenced by Rubens and Titian, van Dyck spent the last decade of his life as court painter to King Charles I of England. This portrait was made while van Dyck lived in Italy (1621 – 1627), where his portraits of Italian nobility proved a high-point in his career. Maddalena was the daughter of Giacomo and Elena Grimaldi Cattaneo and her picture, along with the companion portrait of her brother Filippo, was intended to hang alongside their mother’s portrait in the family palace. All three paintings are in the NGA. Shining out star-like from the darkened interior, Maddalena is brought to life with exquisite sensitivity. 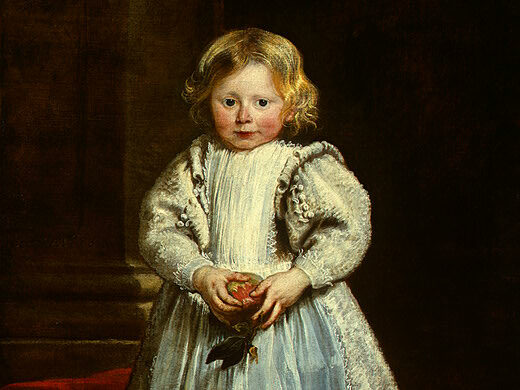 Anthony van Dyck is all about mastery of texture and here his breath-taking brushwork works the oils, whipping up the frothy seams and surfaces of the cream-colored dress. See the sleek folds of the ice-blue apron and the tousled, soft curls that fall around her face. The little girl’s character comes across in her cherubic face. The large, dark, saucer-like eyes gaze (questioningly?) at the viewer, glinting in the light. Her chin is down, suggesting shyness, and her pink cheeks bulge beautifully. But for all the freshness and naturalness of youth, doesn’t it feel like this little girl is shown as old before her time? She seems weighed down by the stately setting she’s in, all classical architecture and lush furnishings. Her dress looks like an encumbrance, its stiff sleeves pinning her into position. 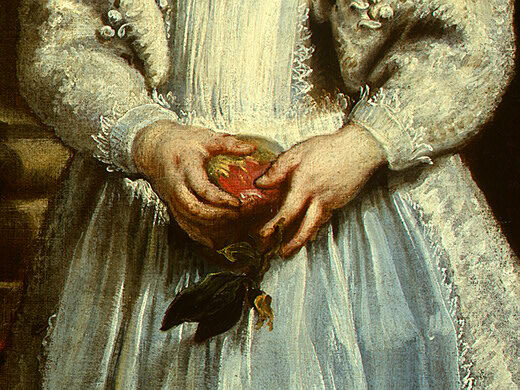 Perhaps most unsettling is that apple, clasped in dimpled hands: it’s a well-known symbol of fertility. 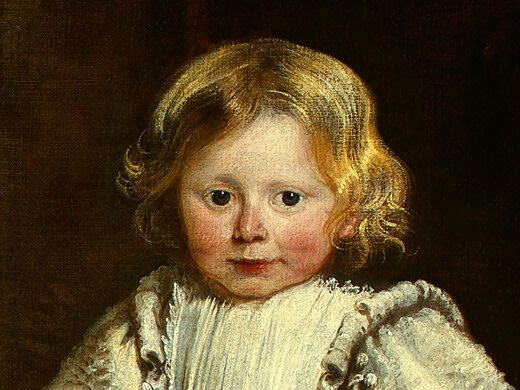 Sometimes, precocious is good: van Dyck was so talented at a young age that he was apprenticed as a ten year-old. But when it comes to little ladies, at what point does innocent interest in Mummy’s make-up bag and clothes tip over into too-much-too-young territory? It’s for parents to decide where they draw their line. I just know that there are only so many years you can work the Laura Ashley look, and tots have their whole adult lives ahead of them to totter in heels. Really enjoyed this – quite a perceptive connection! Thanks for posting. I’m curious about your blogging process. Do you go to the NGA every week, and stock up on photographs/reflections for the next seven days? Do you write in a marathon sitting, or do you write each day’s post the night before? So impressed with your dedication!